EAST WILLIAMSBURG — The European party promoters who were shut down by the city multiple times for safety and fire violations and for attempting to throw a rave in a Superfund site were denied a liquor license by the community board for a 6,000 person venue when they refused to agree to close their outdoor space at 1 a.m.
"They're entitled Austrians who operate a club in Switzerland who come here and think they can do whatever they want," said Thomas Burrows, a member of Greenpoint and Williamsburg's Community Board 1, following a unanimous vote against the liquor license application for the venue Avant Gardner, also known as Brooklyn Mirage, Tuesday night. 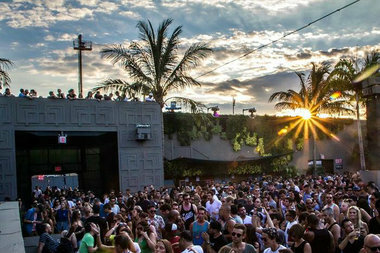 Owners Billy Bildstein and Simar Singh, the international electronic dance music party promoters behind the CityFox Experience, have been trying to get their 6,000 person venue in industrial East Williamsburg up and running since last June when it was shut down for safety and fire code violations. The board's recommendation, which is advisory, now goes to the State Liquor Authority, which ultimately decides whether or not to grant Avant Gardner LLC, located at 111 Gardner Ave., the right to serve booze. The owners declined to comment following the Community Board's decision. Spokeswoman Shira Berg later said that the owners respect the community's decision, but will still push for a full liquor license with the SLA. Tuesday's vote is the second time the Community Board has blocked Avant Gardner LLC's application for a liquor license for their sprawling venue in industrial East Williamsburg, owners hope will one day play host to concerts, movie screenings, photo shoots, art exhibits, fundraisers, fashion shows, corporate events and galas. The massive indoor/outdoor space features 35 live palm trees and 15,000 plants. Owner Bildstein earlier admitted that last spring when he'd come to the community asking for a liquor license he hadn't done his homework. So in his latest effort which began in February, they'd offered a detailed safety plan and promised to host community job fairs, to buy goods and services locally and to paint colorful murals in the industrial area around the venue as part of a "neighborhood beautification plan." Their efforts and $60,000 in funds to lobbying firm State & Broadway Inc. earned them the support from State Assemblywoman Maritza Davila and City Councilman Antonio Reynoso. Despite the changes, community board members worried Avant Gardner hadn't reached out to enough community organizations about the jobs they would offer, members said. St. Nicks Alliance, which had first said it would back the venue later pulled its letter of support when they said they found out Avant Gardner was paying its workers, "off the books and not in a timely manner," a Feb. 13 letter from their Workforce Development program manager reads. St. Nicks Alliance didn't respond to request for further comment and Berg, a spokeswoman for Avant Gardner LLC, denied the company paid its workers off the books and said the accusations against them were false. The owners behind Avant Gardner LLC have been ruffling feathers in North Brooklyn since 2015, when they threw more than 20 pop up parties with temporary liquor permits at 99 Scott St.
That Halloween, they tried to throw a rave inside Greenpoint's NuHart Plastics building, a state designated Superfund site. It got shut down by fire marshals before it began and while they were not faulted in the incident, the developers eventually had to pay $150,000 in fines to the state. Last spring they reopened at 111 Gardner Ave., still relying on temporary liquor permits, had their booze confiscated by police, threw several dry events to the chagrin of party goers and finally were fully vacated in June for safety concerns.